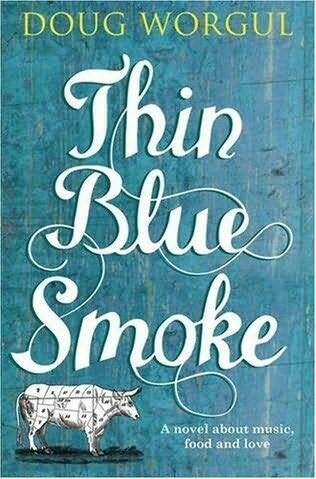 Thin Blue Smoke by Doug Worgul. Pan Macmillan New Writing, 2009. Good barbecue joints are those which you can drive up to and see a faint plume of thin blue smoke lazily rising up toward the heavens, leaving behind it the heavenly flavour of the distinctly American barbecue. These restaurants are a haven for everything that quintessentially defines Americana, from faded chipped plastic Coca-Cola signs crowding out the proprietor’s name out front to the gathering of people inside a restaurant that, by appearances, must be known more for its food than its decor. It’s a food that may be eaten in any clothing, but is most comfortably enjoyed in a t-shirt blaring the slogan of the local sports team (baseball, football – just not ‘soccer’) and a pair of jeans that have seen hard use and the washer. The acknowledgement that the food will be just plain messy is presciently prepared for by disposable cutlery and dishes and, in some places, rolls of paper towels sitting at both ends of extra-long picnic tables. These are the places presidential hopefuls cotton to when they wish to curry favour with the locals; church groups meet here after fervent prayer sessions; Hells Angels chapters frequent them after a long Sunday’s petrol-fuelled drive; musicians play venues at or around these joints when they could command larger stages for more money. It is this America that Doug Worgul wishes to paint with his first book, aptly titled “Thin Blue Smoke.” But it is not an entirely idealistic America which he paints – it is, instead, a recovering America which has, over time and with some form of a divine ‘thin blue smoke’, overcome much of the religious and racial strife which characterised it fifty years ago. The novel is comprised of many small vignettes which begin divergently enough as separate (and sometimes unsavoury) ingredients similar to those needed to make a good barbecue. As the novel comes together, these vignettes converge upon ‘Smoke Meat’, the nickname for LaVerne Williams’ Genuine BBQ and City Grocery. The nickname is drawn from a name painted over the front door of the establishment, inexplicably written in poor grammar by the owner’s exceptionally intelligent son. The owner, LaVerne, a black man, is a former professional baseball player who has never known his father but has been raised in the Christian confines of his grandmother’s home and steady, manly influence of his barbecuing uncle. A host of other characters bring the story together, black and white, and from various socio-economic backgrounds. Good barbecue does just tend to bring people together that way, and Mr Worgul captures this effectively. His characters naturally have flaws, though they wear them as if they are only temporarily marring the essentially good soul beneath. At first this approach to character development – hardly the eternal character flaws of iconic authors such as Dostoyevsky or Graham Greene. This approach is very Christian, however, as literary criticism looks for characters who perform exceptional feats in spite of their flaws. Mr Worgul’s characters do not overcome any of their obstacles alone but through intense dedication to their Christian faith and the network which has been developed around it. I struggled with this throughout the book, both for personal and literary reasons. Mr Worgul does lay on the Christianity a bit thick, however, and its application to the characters lacks the subtlety of flavour that characterises truly good barbecue and characterisations alike. His insistence on the characters’ asking basic questions about Christianity, and the long monologue answers which follow, do not serve to move the basic story along, but instead serve to proselytise his audience. This effort is unnecessary, as the essential elements of the Christian faith which remain without these evangelical-style leaflet interruptions are convincing in their potency to evoke thinking about the effect of Christianity. Furthermore, these clunky dialogues place awkward sentences in his character’s mouths, detracting from their otherwise colourful manifestations. To continue the barbecue analogy, it’s akin to drowning a good platter in sauce. The story is still one of a healing America. LaVerne, in his only moment of philosophical pontification, points out that barbecue takes elements that on their own are bad – smoke and fire, cheap beef and vinegar, and combines them over time to create something that is exceptional in depth of flavour. The Christian analogy is obvious, but comforting, in that over time, when we are placed in a pressure cooker of life and surrounded by a lot of bad bits, we can emerge better for the time. Mr Worgul might not have struck a home run with this book, but he’s come close to it. I welcome the next addition of his fiction to the literary scene, though I beckon him to tone down on the sauce just a bit.